"You need basic and important qualifications: strength, balance, bravery and sense. This means that you have to know what you are doing at that moment. One has to be aware that the castle doesn't lean to any side, that you will be balancing the weight with the one underneath you and also help the person over you so he or she won't wobble. These are all necessary skills and preparations for a good casteller, what a good "casteller" needs to be." "(What happened two weeks ago) it was the first time a child who fell straight from the top of a castle has died. After of thousands of falls, this shows that this is not a risky discipline. Nobody thought that a child falling from a tower like that would die. It is the first time and I don't know why it occurred. The laws of physics taught us that injuries from such a fall are minimal and not compromising, until now." "I have to go up quietly, step by step and try not to move the structure." "A football player plays for Barca (Barcelona FC) today and tomorrow he changes for Real Madrid or Zaragoza. Here it's different. Once you enter a "colla" (group of "castellers") you never change to another one. In my youth I used to have a shop and no one from rival Colla Jove would come to buy anything from me. Nowadays this has changed; it seems we are becoming more human in that respect." "My father goes in the "folre" or the "pinya" (lower levels) and my brother stands right underneath me. He used to be as high as me but now he grew up and he went down a bit. But this doesn't generate any kind of competition between us." "My son also fell down from a nine-storey tower five years ago and he had head injuries. But he likes it so much he didn't want to stop. One year after the accident, he climbed the same castle successfully." "Of course there is rivalry, but this is good. In big celebrations such as Saint Joan, you need a level of rivalry, to try to be better than your competitors. It makes you improve." "This is a very traditional celebration in our country. I am the mayor of Vallmoll. The castellers from Colla Vella tell me that I have to be a mayor for everything, so they make me do this. For all Catalans this is our national sport." The human pyramids, or "castells", of Spain's Catalonia region is one of the areas oldest and strongest traditions. Huge flesh-and-bone towers are created with layers of people standing atop one another, creating structures often as high as a five-storey building. But now questions about safety are being raised after a twelve year old girl died after falling from the eighth level last month. However the people who take part (known as 'castellers') insist their sport is safe. Spectators hold their collective breadth as one by one the 'castellers' climb the human tower. The tower is complete when a small child, no heavier than 70 pounds (five stone or 32 kilogrammes) reaches the summit. Ninety miles southwest of Barcelona, the city of Valls is located in the heart of Spain's Catalonia region. It was here in the Tarragona province where the human pyramid tradition called "casteller" began 200 years ago. No one knows exactly how the tradition evolved, but today a festival in the region wouldn't be complete without the appearance of these human pyramids. The "castellers" are organised into groups or "collas". The Colla Vella (old group) and Colla Jove (young group) are two arch rivals in Valls. Colla Vella is Catalonia's oldest group and have toured internationally with their stunts and structures. The group's head Juan Romero says you need " strength, balance, bravery and sense" in order to be a good team member. The group's eldest member, Artur Foret, says that his sport is much different than football where players are traded and move from team to team. Once a "casteller" joins a group, they never switch to another, he says. Foret now stands at the base, known as the "pinya", a honeycomb-like formation of men who make up the support pillars. To help "castellers" get a grip, a ten-foot-long sash called a "faixa" is wrapped tightly around the waist. The "faixa" not only helps support the lower back but it also serves as a fabric handhold for those ascending the "castell". Special tunes are played during the construction so that the "castellers" on the bottom of the heap know just how far those above have climbed. 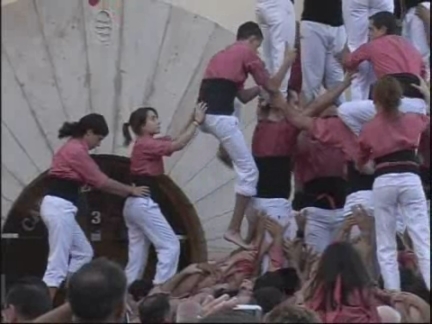 Topping off each "castell" is the "aixeneta", a small child who climbs up the backs of his fellow tower mates. Once atop the "castell", the "aixeneta" gives the "all-clear" gesture signifying the successful completion of the "castell". The Corralcoba family is an example of how the "castellers" culture brings together different generations in a single passion. Genaro Corralcoba joined Colla Vella with his son Adrian and daughter Irina. Although his son suffered head injuries when he fell from a nine-level tower five years ago, he didn't want to stop participating. One year after the accident, Adrian climbed the same castle successfully, his father says. The family recently travelled to participate in the Colla Vella's exhibition in the neighbouring village of Vallmoll. They displayed their unique nine storey castle with an inner six people pillar. Exhibitions consists of three human castles followed by a pillar of people standing on each other's shoulders. Although falls are considered part and parcel of being a "casteller", some groups are under pressure to have children standing on the top use protective helmets after a young girl died from a fall last month. On July 23, twelve-year-old Mariona Galindo from Colla Capgrossos in the northern town of Mataro fell nine levels to her death. Jaume Vinyes , a medical doctor and "casteller", maintains that building human pyramids is not risky and falls don't normally result in serious injury. However, the "castellers" have regulated themselves for the last 200 years and say that the decision to use helmets is theirs alone to make. In addition to Mariona's death last month, the "castellers" have recorded two other deaths in the last 200 years. 1. Clowns in parade chanting (Spanish): "The clowns are here and we are going to the chapel. If someone doesn't like it, they can return another day." "I came to thank the Virgin (of Guadalupe) and God for all the work we have had this year, that is all." "We came here to say thanks to the Virgin who has given us health, life and work. We love you all so much." 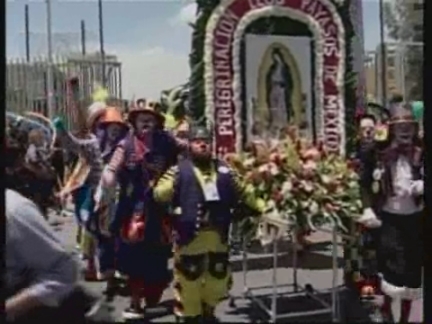 Hundreds of clowns marched Mexico City's Guadalupe Basilica on Wednesday to receive their blessings of laughter for the year. For these clowns, religion is no joke. This is the fifth time the group has joined the pilgrimage along Guadalupe Avenue to take communion. The Clowns Club came equipped with colourful wigs and costumes, red noses and large plastic shoes as they sang and played on their way to the Basilica. During the service, the clowns bowed their painted faces and received communion from the priest. One female clown said she participated in the procession "to thank the Virgin of Guadalupe and God for all the work we have had this year." Another clown, whose face was painted with a frown, said he was happy the Virgin of Guadalupe gave him and his fellow clowns "health, life and work." The pilgrimage ended with a party during which the clowns entertained hundreds of children and spectators. Kicks, slaps and punches, everything is allowed in the Tacanacuy, a yearly tradition that takes place in the village of Chumbivilcas on Christmas Day. This year due to a tragic bus accident, which left 42 people dead near the village on December 24th, the Tacanacuy was celebrated in the nearby city of Cusco. Men, woman and even children of the village join the Tacanacuy aiming to solve their differences with a good fight. This is their personal way of leaving all troubles behind and entering the new year with a smile. Referees are always on site to make sure nobody gets hurt. The festival is then wrapped up with drinks, dinner and a dance. "We feel isolated because we are two, not one. I feel a little sorry for those people who live alone, everyone should have twin brothers or sisters." "We live a normal and abnormal life. One of us can't really function without the other. For example if my sister has toothache then by the next evening you can be sure my exact same tooth will also be hurting." "We sent an invitation to the Kaczynski brothers and were very much hoping they could attend but their duties do not allow this. But we know that they were interested and sent a message of congratulations greeting all twins who have come here." 34. Lech Kaczynski (left) and his twin brother Jaroslaw shaking hands. The residents of Czarnkow in north west Poland could be forgiven for thinking they have been seeing double. More than a hundred sets of identical twins recently descended upon the town for the 8th annual Twin Festival. It was a time for double measures in the town of Czarnkow, last weekend. The small town in the north west of Poland was the setting for the country's annual Festival of Twins. More than a hundred sets of identical twins from all over Poland attended the celebrations, the youngest just two months old and the oldest almost sixty. The day-long festivities began with a church service. Then the fun started with music, dancing and games. The festival is now in its eighth year and attracts more and more twins each year. For student Silvia Burzinski and her sister Ljida it was their first visit to Czarnkow. There were many children at the festival, and pride of place was given to the youngest participants, two-month old Ingi and Ady Grezkovek. Local councillor Teresa Abramcik and her sister Helena said they felt normal at last during the festival. Czarnkow's brass band accompanied the participants on a march through the town. But Poland's most famous twins could not come to Czarnkow. Jaroslaw and Lech Kazynski were famous child actors in the early 1960's. Now they run the country, with Lech as president and Jaroslaw as prime minister. Polish President Lech Kaczynski on 19 July 2006, appointed Jaroslaw Kaczynski, his identical twin brother and the chairman of the governing Law and Justice party, as prime minister during a ceremony at the presidential palace in the capital Warsaw. Wearing a black suit, the president shook hands with his brother - who looked almost indistinguishable except for his grey suit - and wished him luck in forming a new government. Festival organisers are hoping the powerful brothers will find time to attend the 10th festival in 2008. The theme of this year's festival was "twins are our future". The number of twins around the world is on the rise. Since 1980 the number of twin births has nearly trebled. Scientists say this is largely due to women delaying childbirth, and to the introduction of in vitro fertilisation. Czarnkow is the first Twin Festival to be held in Eastern Europe. The world's largest festival is held each year in the American town of Twinsburg, Ohio and attracts more than 2500 sets of twins. Multiple births, usually twins, occur when an egg is fertilised and then splits into two developing zygotes, or when two eggs are fertilised by different sperm. The results are, respectively, identical and fraternal twins. 4. Mid of banner reading: (German) "Divorce fair"
6. Close-up of cameraman filming sign "Divorce Fair"
9. Close-up of poster reading: "Paternity Test, DNA Confidence"
"Parents must know that parenthood is for whole life, whereas a partnership may end. This means that your own child is your concern for a lifetime. In this sense, we call on all parents to give priority to the child's well-being, to keep or re-acquire a good basis of communication, when a child is concerned." "I did not get much out of this exhibition. It is a very superficial way of dealing with the subject. As a person concerned, I can say that this is a very painful thing, and this exhibition was like a kind of a joke." 18. Close-up of poster reading: (German) "Your divorce party"
Journalists easily outnumbered those looking for advice on how to end their marriage on the first day of Vienna's divorce fair, billed as the world's first. The Austrian capital seemed like a good venue to launch the mirror image of the marriage fair. The city has a 66 percent divorce rate, putting it in the upper category of European cities, while the nationwide rate is more than 50 percent. But only a few dozen visitors meandered through the two conference rooms of a downtown luxury hotel and bemused exhibitors were kept busy mostly by TV crews lining up to interview them. The focus at the event was on untying the marriage knot. Most of the 16 firms with stands at the fair offered standard divorce fare - legal services, private investigations, mediation and conflict management. But some catered to more unusual needs. At one stand, DNA analysis promises to end bickering about why the little one does not look like daddy - or mommy - for 420 Euro (600 US dollars). Magarete Weidenhofer deals with parenthood in a different way. As an adviser at "Rainbows", a support service for children affected by divorce or separation, she tries to send a message that "parenthood is for whole life, whereas a partnership may end". "We call on all parents to give priority to the child's well-being, to keep or re-acquire a good basis of communication, when a child is concerned," Weidenhofer told AP Television. Still, the emphasis on Saturday was less on the emotional and more on the financial and legal aspects accompanying a divorce - a fact criticised by some looking for more than just a chance to limit the mess of their marriage break-up. "I did not get much out of this exhibition. It is a very superficial way of dealing with the subject," said one visitor, who did not give her name, explaining that divorce was a private matter. "As a person concerned, I can say that this is a very painful thing, and this exhibition was like a kind of a joke." A pre-soviet tradition is being revived in Russia as Cossack horsemanship took centre stage at a recent military festival. Skilled riders wowed the audience with the display of tricky manoeuvres and the teamwork between man and beast. Russian soldiers, policemen and enthusiasts gathered to resurrect the Cossack traditions of skilled swordplay and horsemanship. The riders showed off their skills of horsemanship and agility as swept past their audience, rarely missing a target. The Equine Military Festival of Dzhigitovka, an ancient style of performance riding was the first event of its kind to be held in post-Soviet Russia. Horsemen from a number of military regiments slashed their way through plastic water bottles, cabbages and other targets in their attempts to impress the judges. Dzhigitovka, which is the ancient style of performance riding, originated in the Caucasus and Central Asia amongst the Cossacks, and was prevalent and very popular among Russia's pre-Revolutionary cavalrymen. Participants, many of whom are serving soldiers from elite cavalry regiments, such as the Presidential Guard, competed for prizes in a variety of disciplines. The Cossacks were formidable horsemen and soldiers who lived in Eastern Europe and Asiatic Russia. After being absorbed into the Russian Empire they became a pillar of the Imperial Army. In the hope of gaining greater independence, many Cossacks sided with anti Bolshevik forces during the Russian Civil War, and were as a consequence virtually destroyed by the Communist state. But in the current post-soviet era, many people are looking to the past and reviving old traditions. Enthusiasts say the expansion of this sport is a good way to encourage young people to take up more physical pursuits. The revival of Cossack heritage and appreciation of their military skills is met with enthusiasm by Cossacks themselves and those in Russia who want to see a return to pre-soviet values.
" Why did I choose to paint clowns on the wall? The space''s isn''t easy - it is very complicated, high but limited in width. I decided to paint clowns. I like humour. I chose clowns because it''s a subject I''ve been involved with for 25 years working in Montmartre in France." "Each year I am really happy to come here because it is the ideal place to meet lots of artists with different nationalities. It is the ideal place this beautiful town of Asilah because it give us a lot of inspiration and joy." "The Moussem of Asilah brings Moroccan artists international contact with other artists who participate in the moussem. It is an advantage to participate in the workshop and to share knowledge with other artists who come from all over the world." "We acquired some presses and we started the first I would think the first workshop in engraving and etching in Africa and perhaps also in many parts of the Arab world. Because most of the artists would go to Portugal to Spain to France to learn etc." "I think the colours I''m using are different since I''ve come here. It''s because of the influence of the city and of the other artists with whom I am living. We are sharing time together and we have conversations together. And we work that we are doing here all together has has influence." "The fact of being on the Atlantic in Asilah - its clear that every time you move you''re uplifted by the place - the architecture, its environment, the people. I find that this absolutely influences my work"
Every year artists from around the world gather in the small seaside town of Asilah in northern Morocco to celebrate a moussem - or cultural gathering. The whole of the old town is involved in the arts festival, which involves painting the white walls of the town with colourful murals and holding artists'' workshops. The fortified town of Asilah in Morocco began life as a fishing village. It''s favourable position on the north western tip of the country, on the Atlantic Ocean put it in the front line of a string of invasions by the Portuguese and Spanish. Now an invasion of a different sort takes place each summer - a cultural moussem that attracts outstanding artists from around the globe to paint murals on the stark white walls of the old town. Foreign artists arrive to celebrate and collaborate with their Moroccan counterparts. Japanese artist Akemi Noguchi is painting a mural on a town building featuring brightly coloured clowns. He says he is painting clowns because they always raise a smile. "Why did I choose to paint clowns on the wall? The space''s isn''t easy - it is very complicated, high but limited in width. I decided to paint clowns. I like humour. I chose clowns because it''s a subject I''ve been involved with for 25 years working in Montmartre in France." As well as the large-scale outside work, the artists also have the use of studios where they can work on printing, painting and sketching. The equipment is there for their use. For artists, one of the many charms of the Asilah festival is the pleasure of meeting fellow artists who have participated in previous moussems. Moroccan artist Sanae Sarghini has attended the festival six times. She says that Asilah is the perfect town for a festival. Although artists may be influenced by other artists work, there is a huge variety in genre and style. Rahhoule Abderrahmane, a Moroccan painter, says that knowledge sharing is key for the painters who participate. "The Moussem of Asilah brings Moroccan artists international contact with other artists who participate in the moussem. It is an advantage to participate in the workshops and to share knowledge with other artists who come from all over the world." The festival was founded by the mayor of Asilah, Mohamed Benaissa. A former foreign minister of Morocco, he has been instrumental in making the moussem an outstanding success. As Benaissa says, the printing presses in Asilah were the first in the region. "We acquired some presses and we started the first I would think the first workshop in engraving and etching in Africa and perhaps also in many parts of the Arab world. Because most of the artists would go to Portugal to Spain to France to learn." Benaissa, himself a photographer, visits the workshop regularly and takes a keen interest in the work being produced as part of the festival. Spanish artist Carla Querejeta admits that she is also under the spell of people and place - and her work is influenced too. Local man Hussein Mimouni agrees saying it is the atmosphere of the town of Asilah that is key to the blossoming of the festival. As the festival progresses, the towns'' walls fills up with artworks and brightly coloured murals. Those murals deemed most popular will stay on the walls for one year after the festival is finished. "We want to enjoy, to see who will be world champion, maybe with a bit of luck is our moment." Around 400 couples from 23 countries around the world were in Buenos Aires on Sunday to take part in the Sixth World Tango Championships. The participants came from places as far away as New Zealand, Japan and the Balkans. 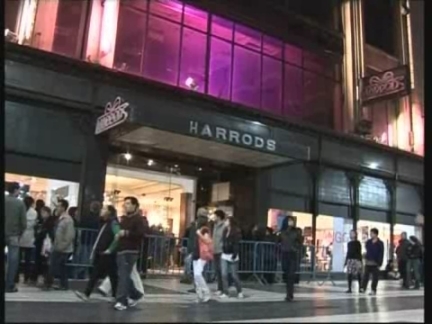 The event took place at Harrod's shopping centre, an historical building in Buenos Aires which reopened its doors after a ten-year renovation project. 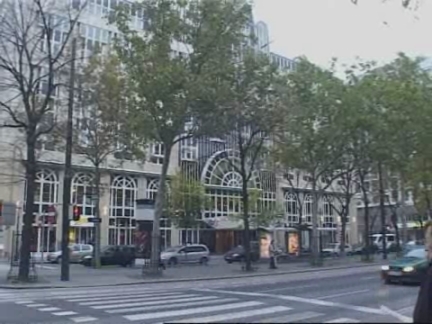 The world championship is part of the Festival of Tango, held in the Argentine capital every August. The contest is due to go on all week, with the couples going through a series of qualifying rounds in the type of tango they choose, Tango Salon, the most traditional one or Tango Escenario, which devotees and critics describe as 'acrobatic'. Tango Salon judges look for elegance and feeling between the couple but in the Tango Escenario, the jury values the choreography above all. The Festival of Tango attracts tens of thousands of visitors, according to local authorities. Officials said more than 200,000 visitors had signed up for one of the many activities, such as free classes, included in the festival's program. In 2007, Argentine couples won in both categories but in 2006 the prize went to Colombia. "The reason why these penguin friends came out dressed as Rudolph and Santa is to celebrate Christmas in a special way with young children." "Seeing the penguins makes me want Christmas to arrive." Twelve penguins dressed as Santa Claus (Father Christmas) and Rudolph the reindeer waddled around an amusement park in the South Korean city of Yongin on Tuesday, in a special pre-Christmas treat for local children. Those who were lucky enough to see the flightless seabirds in full Christmas regalia weren't disappointed. "Seeing the penguins makes me want Christmas to arrive," said kindergarten pupil, Lee Do-eun. 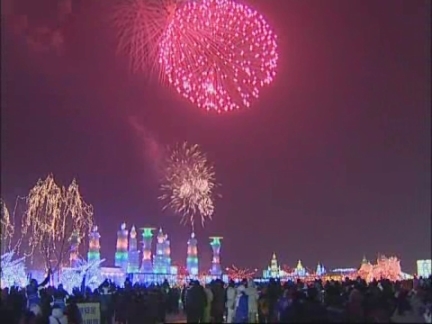 "The ice festival is a symbol and a regular event in Harbin city and has been held for years. I have always been hoping to visit this snow and ice world and that wish came true at last today. I enjoyed myself a lot today." "I think this is one of the most significant things I've ever seen in the whole world. It's very, very, deeply impressive." Thousands of visitors attended the 23rd annual Snow and Ice festival in Harbin, to see a range of architectural attractions made out of ice. Covering an area of 400,000 square metres and built with 120,000 cubic metres of ice and snow, the park is situated on Sun Island on the Songhua River. An organiser said that most visitors had come from Russia, South Korea and China. Some had also flown in from Europe. "This is one of the most significant things I've ever seen in the whole world. It's very, very, deeply impressive," said Carsten Klein, a visitor from Germany. The ice festival is a long established tradition in Harbin. ''I enjoyed myself a lot today,'' she added. A series of sports activities on ice will also be held during the event.